I’ll have a new tutorial and pictures from April and March’s Monthly Apparel. In the meantime, take some time for yourself this week. See you soon! Yep. My sewing room has now been relocated, down into the main traffic area into the sunroom. I knew it was time, and honestly I didn’t mind moving downstairs all that much. Math Boy took my workroom and got his desperately needed OWN SPACE. 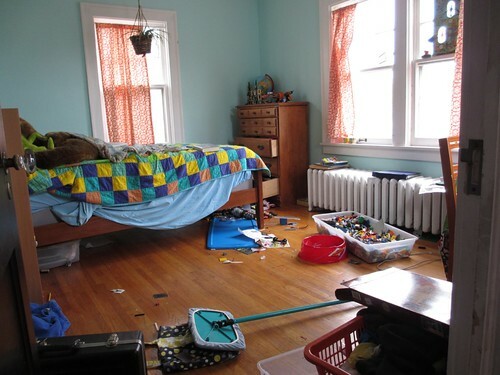 Spinner moved out of our bedroom and in with Knittykid , and boatload of toys moved up into their bedrooms. I thought I would miss that one special room that is all mine, but honestly I don’t. I found that it was kind of becoming a shrine of sorts. 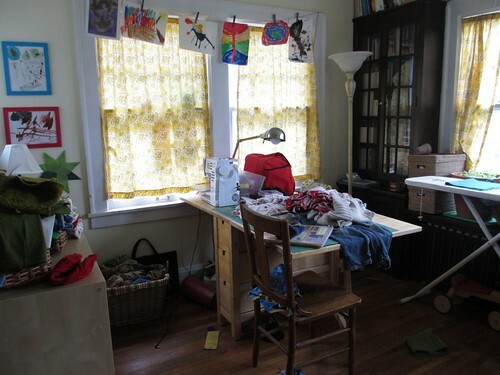 I would go in, tidy my stuff, make some plans, admire the fabric and yarn and…not really accomplish all that much. Now my stuff is right when I usually am. So I can try to do a little bit here, a little bit there. It’s keeping things fresh in my mind and ready to go. I’m doing more. 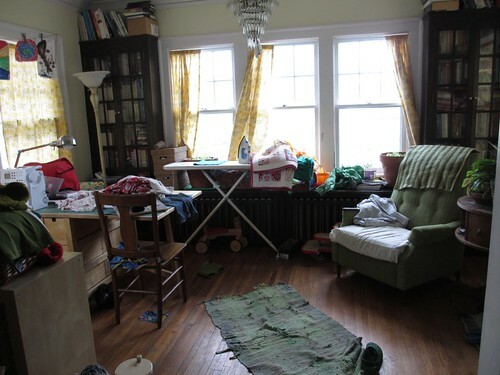 The only big downside is my things are spread out: fiber in the bedroom, yarn and fabric still on a shelf and the closet in Math Boy’s room, books and more fabric down in the sunroom. The boys are not getting into it quite as much as I thought they would, although there has been one major case of abuse, one that nearly had me calling in the authorities. The victim?? What will happen if I smash mama’s favorite flower pot on the sidewalk? What will happen if I throw water all over the living room? What will happen if I drop a large rubbermaid tub over the stairwell onto my brother? What will happen if I climb the curtains? And yes…What will happen if I cut the string on mama’s spinning wheel, tip it over and drag it around the house screaming? He’s lucky the spinning wheel police don’t exist, and if they did they probably would not arrest a three year old anyway. 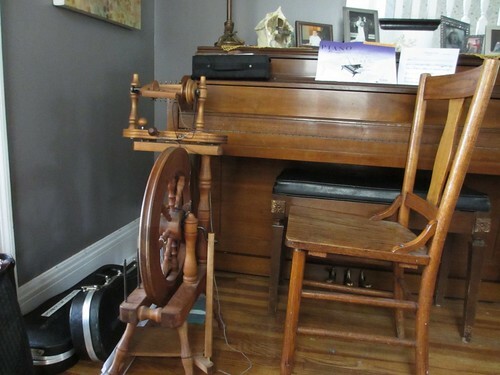 So my poor spinning wheel might need to live in the much more peaceful bedroom, rather than next to the piano where she is victim to much torture and grief. Despite that, it’s a good move. A slight cure to my previously mentioned ennui. I’m trying to dive right into some real work, and not worry too much if I only get to do it for five minutes. The big thing is getting back to actually trying to make something, and let the focus come back when it’s time. Iron some fabric. KNit a swatch. Trace a pattern. A little bit of meandering might be just fine right now. I seem to be experiencing some sort of creative ennui. 1. I haven’t knit a stitch in over a week. The last time that happened I had a newborn. 2. My spinning wheel has sat untouched since November. 3. My Monthly Apparel aspirations are barely keeping me in the game, but my March effort was a simple knit skirt that still needs some finishing. And if it wasn’t for the fact that Monthly Apparel was my idea, I’m not sure I even would have sewn that. 4. No quilting since the quilt-in I attended in February. 5. Writing? This blog? I made a list of ideas with a very inspirational note to myself, “Write every day!” Yup, that worked. 6. Patterns? Three great ones I should have typed up, proofed and put on Ravelry. Hasn’t happened. So how do I get out of this funk? I had one realization that I think I’m going to try to work with, thanks to The Skeptic. So tonight I did my push-ups and sit-ups and down dogs in my messy bedroom, while to boys were still awake. I cursed the dirty run with every down dog but I did it. And then I realized, that’s my block with everything. I can’t sew, the room is too messy. I can’t knit the lace shawl, it’s too late and I’ll just fall asleep after two rows anyway. I can’t do that needlepoint, because I don’t know what I’m doing yet and it will take too much time to figure out the stitches. I can’t sew, because I need to go to bed in 30 minutes. Much of my reasoning seems to center around the fact that in my mind, I need these large two or three hour time blocks, a tidy house and no impeding bedtime. And oddly enough, I keep waiting for this to happen. People, you know me. I have three boys. My imaginary time block never happens. Now and then, when The Skeptic takes them to a movie, but then I still spend half the time tidying. So I’m realizing that enough is enough, time to stop looking for the “just right” time and get my mojo back. Lastly, little something to show I’m not totally off my rocker here. I am somehow, producing a scrappy short sleeved cardigan of sorts. Stopped at the sleeves, because that means I have to think and it’s already 9:30. Who can do sleeves at 9:30 at night? Apparently I’m going to try anyway…. Am I doomed to have that bottom garter stitch edge roll up? I think I am.